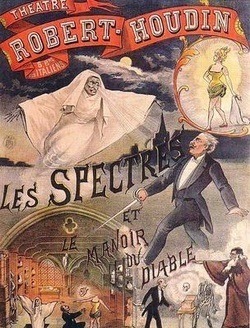 According to Wikipedia in August of 2011, Le Manoir du diable by Georges Melies is the first horror movie. Well, actually its a short film (about three minuets or so) but film was really hard to come by in that time so this counts as a film to me. The plot of the film is basic, you have your hero being tormented by demonic things in a crazy castle room... However, that plot isn't what brought the crowds. The thing that drove the popularity of these films was the fact that you were seeing motion on screen. I suggest going and seeing Hugo. That film is spectacular. It answered so many questions that I had. It really sets the scene and the tone. The film has strong christian overtones and actually ends with Christianity prevailing over the "tides of darkness". I provided a link at the bottom of this review for anyone that would like to see this pioneer in Horror Film. The movie uses very, very early "movie magic" that is an abundance of smoke and mirror trickery mixed with quick cuts. The acting is too brief to judge, somehow none of that matters I am just in awe of this being a film that is over 100 years old. That is nuts. - Known as the Haunted Castle in English. - Was released on Christmas Eve 1896 in Paris, France. - It is considered to be the first Horror Film.